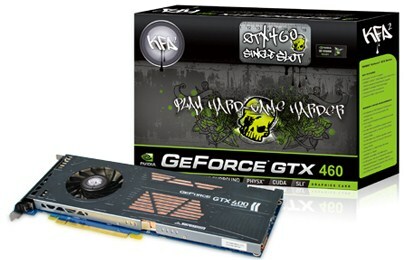 KFA2 Intros Geforce GTX 460 based Razor Edition and WHDI Wireless Graphics Cards. KFA2 has launched two new Graphic Cards based on the Geforce GTX 460 Chip, One is its Single Slot Solution “Razer Edition” While the other is WHDI Wireless Edition GPU. The KFA2 GeForce GTX 460 Razor is a Single Slot Solution card which leaves extra space for additional PCI Interface devices. The card is idle for small HTPC and Form Factor PC’s as it not only takes lesser space but delivers great Price VS Performance Ratio. The card can also prove quite useful to Hardware Enthusiasts as six of these cards can fit in a single PC. “With the KFA2 GTX 460 Razor single slot solution, this has only excelled the GTX460’s overall capability by not only enabling small form factor systems, including HTPC to be able to have impressive performance and features of GTX460 in their build, but also gives the high-end Enthusiast the option to fit six of these slim beasts into one machine” said Graham Brown – European Marketing Manager. 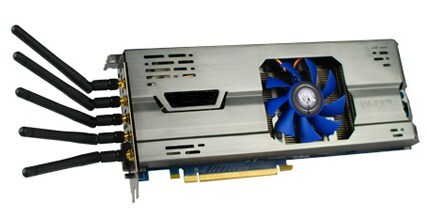 The other card released is the KFA2 GTX 460 WHDI Graphics Card. It’s the world’s first wireless Graphics Card which combines a GPU with AMIMONS’s WHDI technology that allows users to wirelessly connect their desktop/ tower PC’s to their HDTV or distant display without using any wires. AMIMON’s wireless technology is the basis of the WHDI™ (Wireless Home Digital Interface) standard. The WHDI standard delivers uncompressed wireless 1080p 60Hz video (in a 40MHz channel in the 5GHz unlicensed band) providing consumers with the most robust and highest quality HD wireless connection for in-room and multi-room applications. WHDI has a range of 30 meters (100 feet) through obstacles and walls enabling consumers the freedom and hassle free way to connect sources anywhere with in a room or enable multi-room connections. Additionally, the WHDI technology implements HDCP revision 2.0 enabling wireless viewing on the TV of all PC content including Blu-Ray movies and DRM protected content. Looks like the cards will stick to the stock GTX 460 specs, Pricing is not revealed yet however both cards are backed by a 2 year warranty and will be available at leading online and in-store retailers throughout Europe.